The Indigenous fire regime of the Sierra Nevada consists of a sophisticated set of interactions — interactions among people, land, and water that took place for innumerable years before the first European set foot here. The fire regime was based on a varied, adaptable rotation of fire frequency and intensity. The results were environmental mosaics – complex, quiltlike environments with multifaceted habitats – teeming with all kinds of food, medicinal, and basketry resources. Back in those days, wet meadows, with their finely structured, moist fuels such as sedges, may have acted as firebreaks until late in the season, allowing people to steer and diminish fires by taking advantage of slope, prevailing winds, and fuel characteristics. In turn, these prescribed, cultural fires helped to prevent invasion of meadows by conifers, deciduous trees, and shrubs that desiccate meadow soils by intercepting rainfall. The Indians used to burn in the fall. They burned in the oaks, chaparral, ponderosa pines, and fir… Different areas were set on fire in the fall, brushy areas, not the same spots every year… In those times it would seldom get in the crown of trees… They burned every two or three years. You could ride a horse anywhere without running into the brush. Now you can‘t even get off the road. Today, North Fork Mono fires can still enhance the growth of desired plants and, by eliminating competition for water and reducing the interception of rainfall by trees and shrubs, the raise the water table. 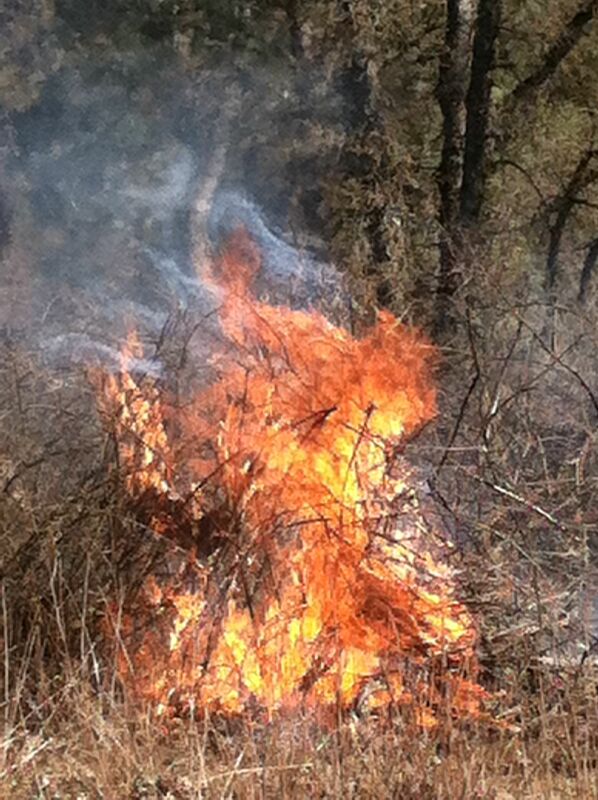 Fire is an indispensable tool in the maintenance of fertile, functional montane meadows. And healthy meadows soils act as water storage tanks. The most recent United States Forest Service inventory shows that the 11,000 meadows in the national forests throughout the Sierra Nevada comprise about 220,000 acres. According to the forest management strategies document [PDF] of the 2009 State Water Plan Update, these meadows could potentially store as much as 500,000 acre-feet of water, eliminating the need for new, massive dams and reservoirs such as the U.S. Bureau of Reclamation’s proposed Temperance Flat development. Meadows with intact vegetative cover act as natural reservoirs, regulating streamflow… through storage and release of snowmelt and rainfall runoff. …These meadows attenuate flood peaks and prolong dry-season base flows. 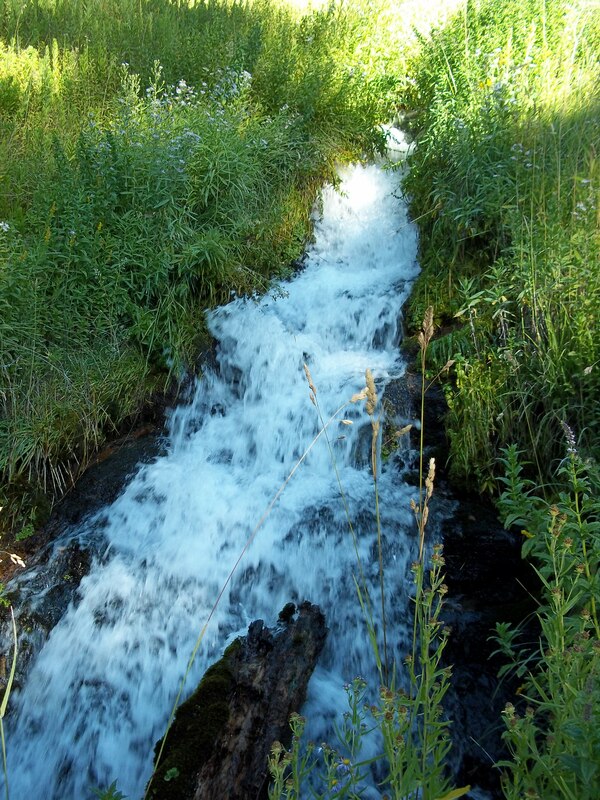 … Meadows therefore increase available water for downstream farms, communities, and hydropower facilities. This regulatory function of meadows could become increasingly important for human water supply as the annual snowpack decreases in the high Sierra, due to climate change. Climate scientists predict that precipitation formerly retained in the higher elevations and slowly released through the summer as snowmelt will fall progressively more in the form of rainfall that, in the absence of alternative forms of storage such as healthy, intact meadow soils, would run off at once. One factor in the historic desiccation of meadows has been the increase of trees and shrubs (due to fire suppression) that intercept rainfall. Much of the water held on the surface of the trees evaporates during or after a rainstorm, instead of infiltrating into the groundwater supply. A dense cover of trees and shrubs intercepts a significant amount of rainfall and prevents the infiltration of water into the aquifer. In addition, recent research suggests that many meadows could have more connections to upland groundwater than previously noted by scientists, and that the flow of groundwater into meadow soils increases with reductions in the density of trees and shrubs on hillslopes and the concomitant reductions in interception and evapotranspiration. Meadows and uplands are connected, and fire can sustain these connections. 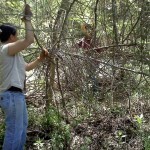 It’s possible to restore meadows and increase their storage capacity. It’s also possible to increase the infiltration of preciptation throughout the watershed by reintroducing the Native fire regime throughout the forest. 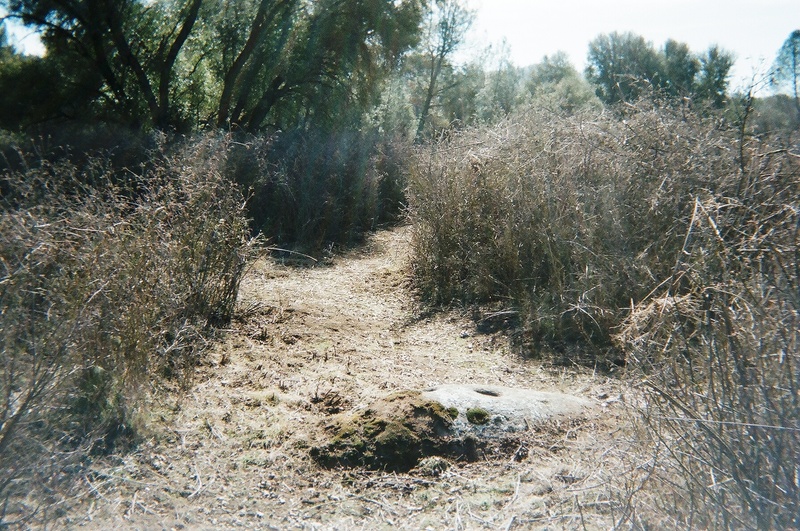 The State Water Plan Update also claims that meadow restoration in the Sierra could have global effects as others learn from the efforts in California. Alluvial valleys in mountainous areas throughout the world, including Africa, Australia, Europe, and South America, are faced with erosion and water-supply problems similar to those facing California‘s Sierra Nevada montane meadows. Many of these alluvial valleys provide water, crops, and forage that sustain local communities and economies. Successful restoration of meadows in California could provide methodologies that are applicable to critical land and water degradation problems around the world. 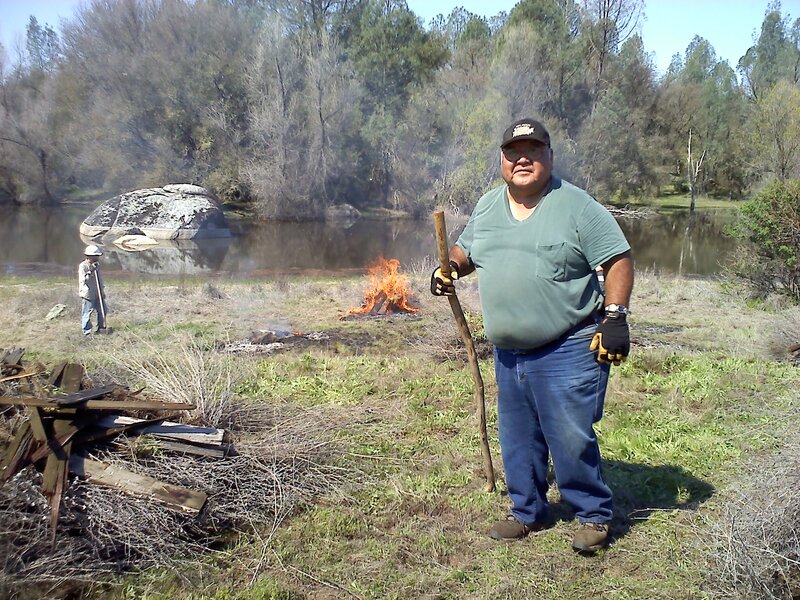 There’s much to learn from Native Californian fire lighters and storytellers. 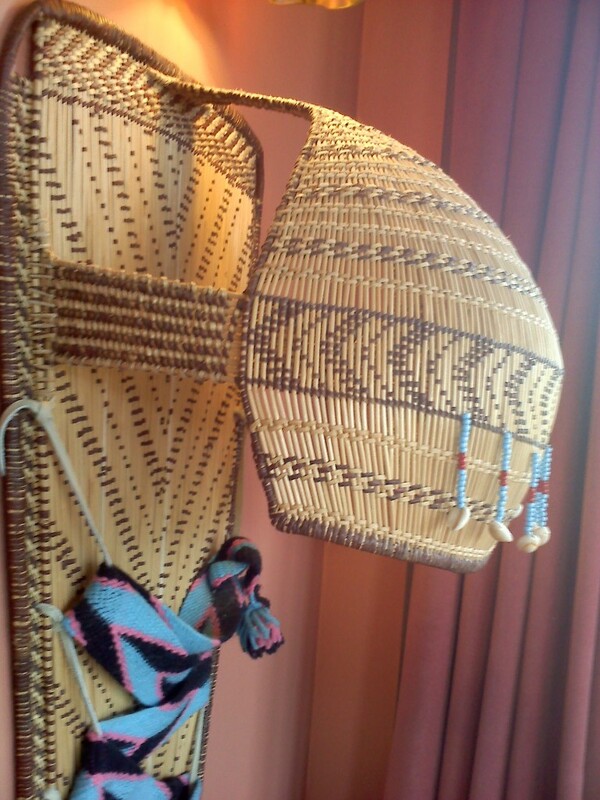 Just as California Indian artists weave the cultural materials of Sierra hills and meadows into an intricate order, so do storytellers entwine land and water into extraordinary narratives. The next steps are up to those who would continue to listen to and learn from the stories. Not a lot of text in this post, only some quick photos. 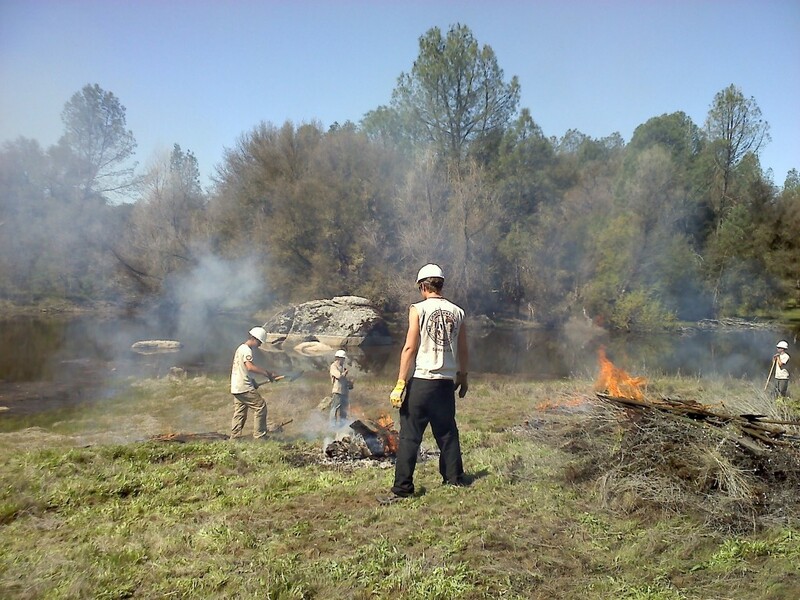 Last Saturday, April 21, a work crew from Santa Cruz-based American Conservation Experience (ACE) and AmeriCorps helped Ron Goode with a few cultural burns in the Sierra foothills. Also on hand to help were Ron’s nephew, Jesse, and yours truly. 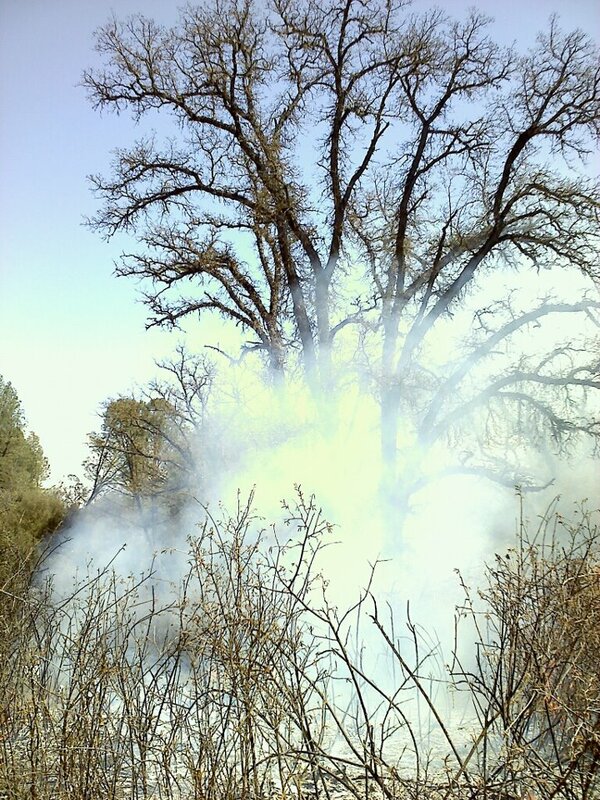 Smoke rises to a diseased oak tree from a cultural burn conducted by Ron Goode on April 5, 2012. Photo by Jared Dahl Aldern. At last week’s Southern Sierra Prescribed Fire and Smoke Symposium in Clovis, California, Nick Goulette of the Hayfork Watershed Research and Training Center shared an excellent website called GoodFIRES, a collaborative project of thirteen state forestry agencies in the southeastern United States. Click through the pages of GoodFIRES for a primer on the theory, practice, and benefits of prescribed burning. Over the course of the morning at the Clovis symposium the overall message of the speakers — fire scientists, land managers, and air-quality regulatory agency staff — became clear: Fire is good. Smoke is bad. 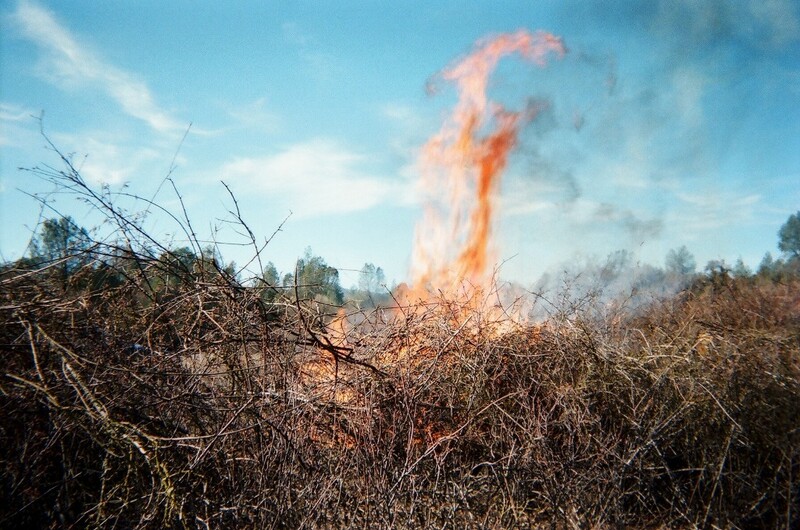 Prescribed fire reduces fuel, the speakers told us. It prevents large, catastrophic wildfires, and it helps animals and plants by keeping their habitats healthy. Smoke, on the other hand, is another matter. The consensus at the symposium seemed to be that smoke is a pernicious nuisance, a pollutant to be controlled and minimized — especially here in the San Joaquin Valley, where weather patterns, topography, and countless sources of pollutants keep Fresno and other Valley cities near the top of the nation’s most-polluted lists. Now, I like clean air as much as anybody else. My family, with our asthmatic tendencies, has suffered since our move from the relatively clean air of San Diego County’s backcountry to Fresno in 2006, and I love the view of the Sierra from Fresno and Clovis on a clear day — a view that is the very picture of “purple mountains majesty.” But on a smoky day, my wheezing and my inability to cast my gaze on the snowy peaks a few dozen miles away don’t stop me from appreciating the benefits that smoke provides. Ron Goode’s comments at the fire and smoke symposium prompted me to ask one of the UC Berkeley fire scientists in attendance whether he knew of any current researchers working on the ecological effects of smoke, and he replied that he did not. The concept of a “smoke deficit” may seem strange. One might say that if smoke contributes to air pollution, then smoke is only a detriment. Yet within the larger ecosystem context, smoke plays a necessary role. For reasons still being studied, the seeds of some plant species require exposure to smoke in order to germinate. Smoke also keeps certain insect populations and tree pathogens at bay. Excluding all smoke therefore could interrupt the natural cycles and environments in which these plants live. As scientists continue to document the many natural and necessary ecological functions of fire, so too they are discovering related beneficial effects of smoke. Whispering bells (Emmenantha penduliflora) germinate when exposed to the nitrogen dioxide in smoke for as little as one minute. 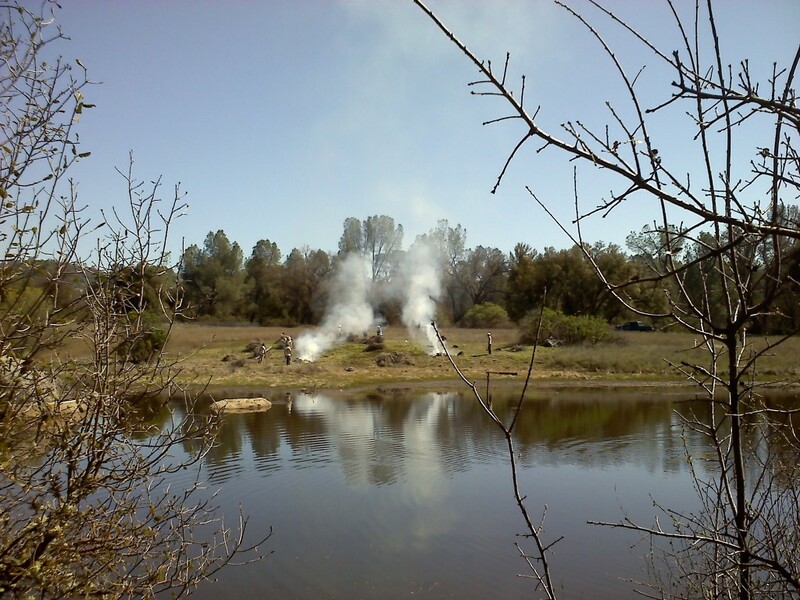 It is possible that the smoke from the fires curtailed oak diseases. It is known that smoking foods reduces microbial activity, yet the effects of smoke generated from burning plant materials has rarely been studied in forest ecosystems. 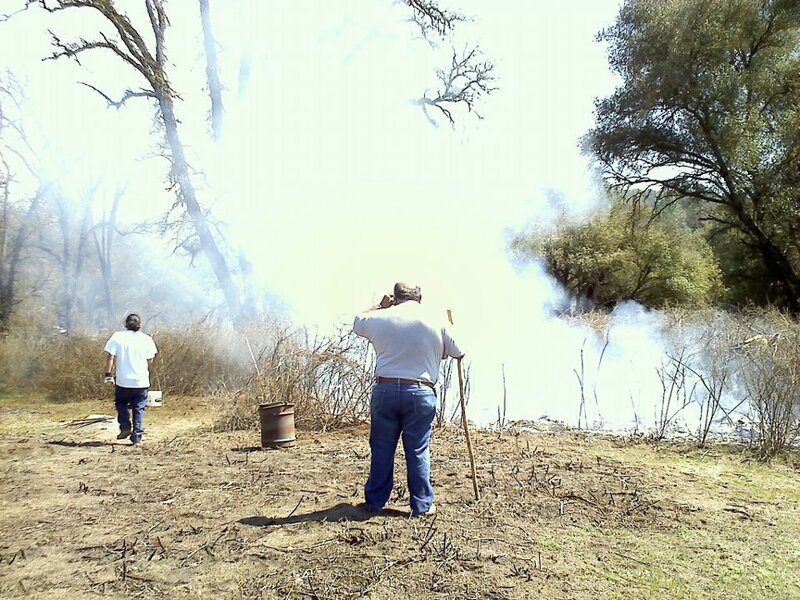 Ron Goode and his nephew Jesse tend a cultural burn in the Sierra foothills, April 5, 2012. Photo by Jared Dahl Aldern. So, I’m easing into the whole blogging thing here. After participating in the Southern Sierra Prescribed Fire and Smoke Symposium this week, I think I’ll go ahead and devote my first-ever blog entry to how Indigenous fire can bring order to the land. 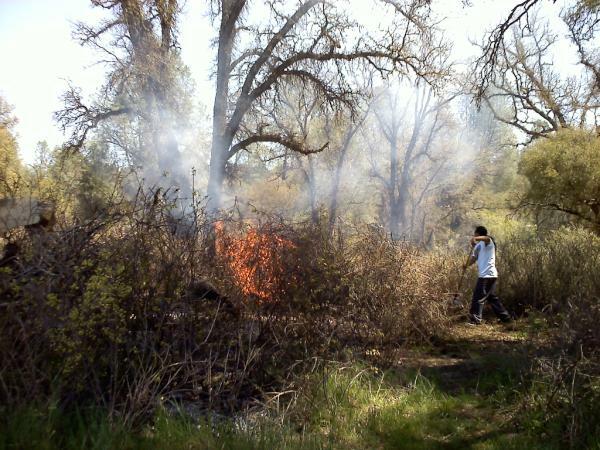 My friend Ron W. Goode, Chairman of the North Fork Mono Tribe, uses fire to care for a stand of sourberry (Rhus trilobata) on land that his family owns in the Sierra Nevada foothills. 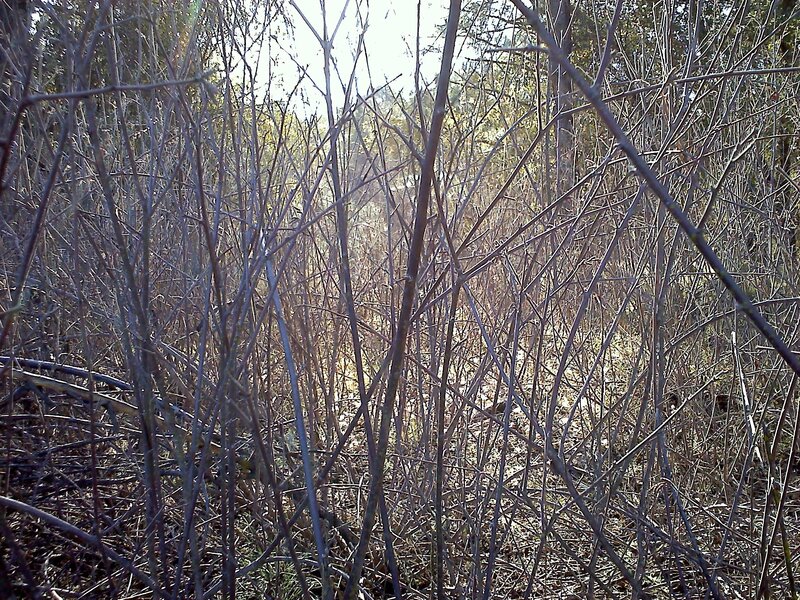 Note the long, sparsely branched shoots of the plants in this last photo. 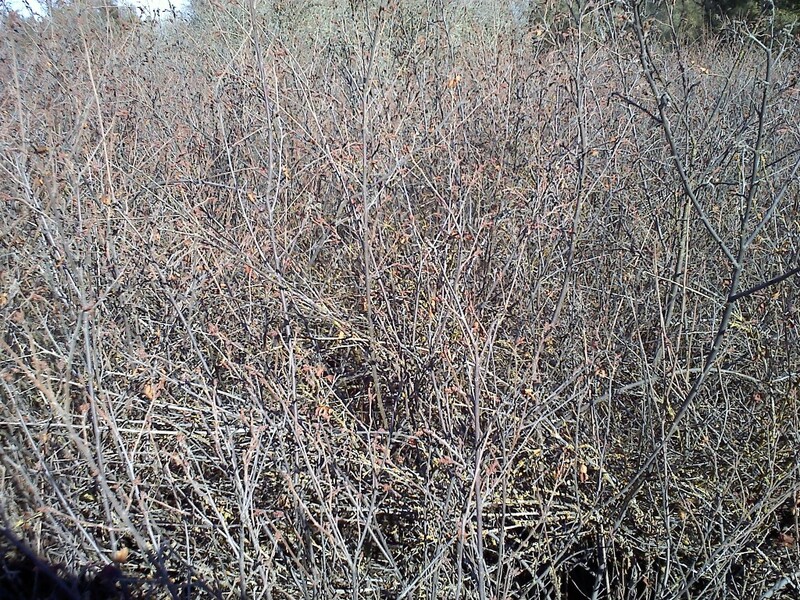 After the fire, more light and rainfall reached the soil, resulting in this vigorous regrowth. At this stage of their growth, these plants don’t need to form multiple leafy branches to absorb adequate sunlight, and the canopy stays open. One sign of a healthy landscape for Ron and other Native practitioners is their ability to “see through” its vegetation. ”Seeing through” is a tough criterion to quantify in a scientific sense — it’s more of an aesthetic judgment, a preference for open country and parklike stands of trees and shrubs, for interconnections between earth and sky. The chevron design evokes arrows and hunting. Metaphorically, these arrows point the way for the infant boy to grow into a good man, hunter, and provider. 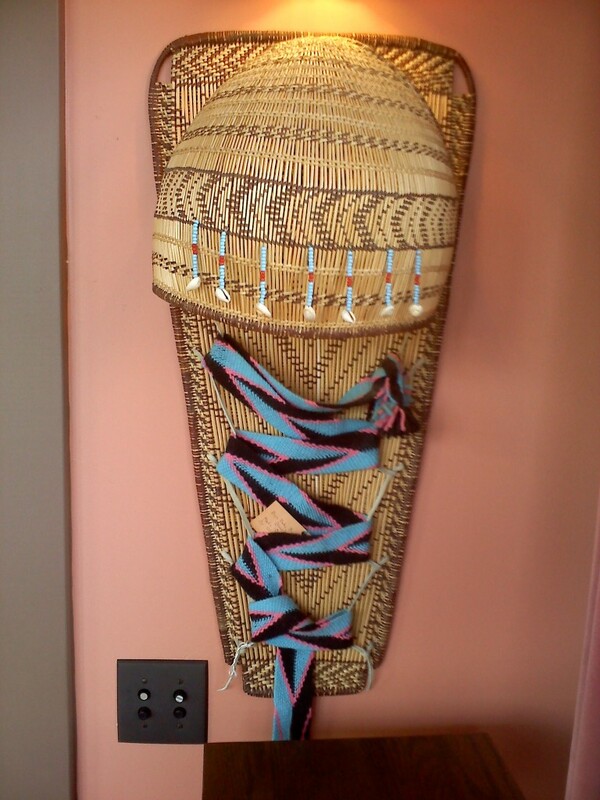 And what’s more, Uly Goode made sure that a baby in this basket will see through the vertical sourberry sticks through which the arrows weave. The structure of the basket reflects and embodies the structure of healthy land — a landscape, sculpted with fire. This is art as education. 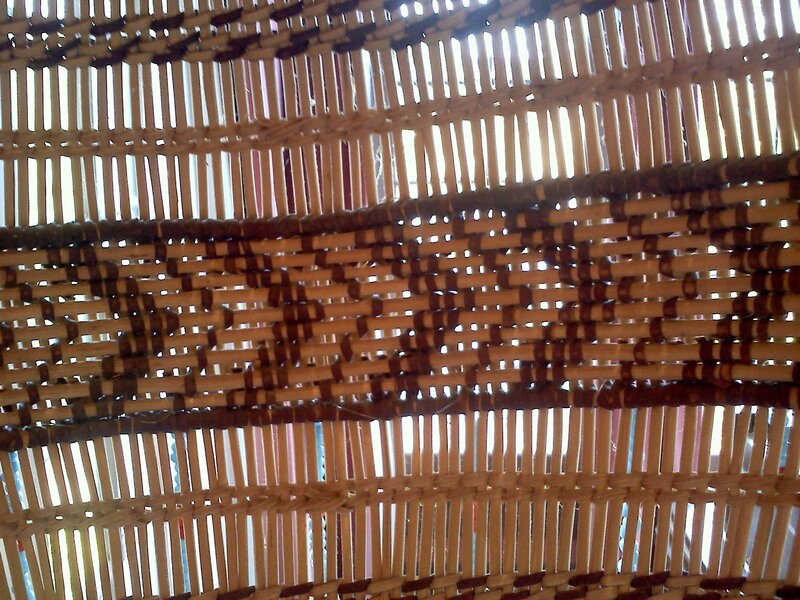 Taking the view of a baby boy in a North Fork Mono basket, we learn about land. More about fire — and a little smoke — next time.